Make sure your dog is not a Kiwi predator! The scent of kiwi is almost irresistible to most dogs unless they have received "avian aversion training" specifically for kiwi. Unlike other birds, kiwi do not have a sternum (breast bone), so even a dog with a very soft mouth can fatally damage a kiwi. 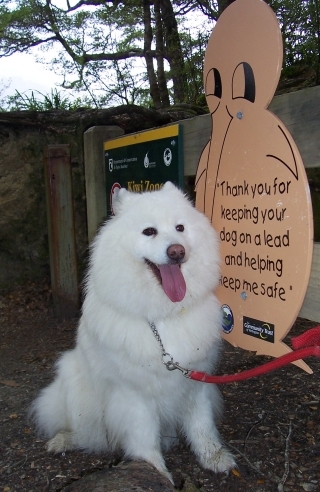 The Remutaka Conservation Trust - with generous support from Pub Charity - now provides annual avian aversion training sessions for dogs and their owners in the region. The first Kiwi Avoidance Training event took place in February 2009, at the Catchpool Centre. 57 dogs were taken through the specially prepared circuit by Jim Pottinger, of National Park. All but two of the dogs were subsequently issued with interim certificates to show that they had successfully passed the avoidance tests. Other Kiwi Aversion Training sessions for dogs are planned every year. Minski does the right thing!